A triennial review of the Joint Nature Conservation Committee (JNCC) starts today, Environment Minister, Richard Benyon announced. The JNCC provides evidence and advice to underpin the Government’s environmental policies. The aim of the review is to look at how JNCC carries out its functions and how it might achieve better quality sustainable outcomes for the environment, the economy and for society. The review is being taken forward as a joint review with the Devolved Administrations. Defra has been working closely with JNCC and their stakeholders since December 2012 to help prepare for and inform the review. “The evidence and advice provided by the JNCC is important in helping us achieve our nature conservation priorities both in the UK and internationally. Preserving nature for future generations is one of the greatest challenges we face as a society and we need good evidence and advice to inform how we do this. 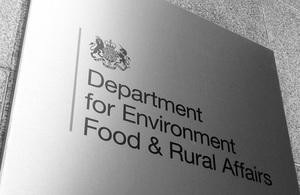 Defra and the Devolved Administrations are committed to conducting this Review in a timely and focussed way, allowing the JNCC to maintain usual business and provide high quality advice and evidence. Views and supporting evidence are requested by 11 April 2013. Preliminary conclusions will be published in the early summer. The review documents can be found here.